In and around the Rocky Mountains, the wholesale destruction of vast areas of pine forests is occurring. The annihilation of these forests is due to a beetle – the Bark Beetle, which devours the soft tissues underneath the bark. The beetle is quite small, bit like a grain of rice. Vast tracks of forests have been ‘lost’ to this beetle; it has been estimated that some six million acres have been affected in the United States, and even greater areas in Canada, especially in British Colombia, where many more million of acres may be lost. Most of the affected trees are old; they have not been subjected to the natural cycle of the forest – which involves fire and regeneration. Hence they are large areas of trees of similar age, all susceptible to the attack of the beetles. The scale of infestation and death is much greater than in the past, when cycles of beetle infestation and fire created a mosaic across the countryside of young and old trees. The scale of the infection is greater than before partly because the uniformity of age of the stands (due to management), but also it is thought that warmer winters have contributed to greater survival of the over-wintering stage of the insect; and a longer growing season for the trees. There is also the suggestion that the beetle can now complete its life cycle quicker. The beetle has spread further north and to higher altitudes than before, which may be a reflection of climate change. Nothing can (or should be done, according to experts) to halt the spread of the beetle; it cannot really be controlled except by specific local measures. When the trees die and rot (a process assisted by the beetles as they introduce microbes that help with the breakdown of the wood), nutrients are added to the soil and other species come in and grow up. For an interesting account of the activities of this beetle, a podcast from the New York Times can be found here. In the U.K, the great spruce bark beetle is something of a problem. It arrived here in the 1970's but once detected, it has largely been controlled by the release of one of its natural predators. More worrying is the possibility that the eight toothed spruce bark beetle could establish itself here. This beetle has been a problem on continental Europe for many years; it has been estimated that Germany lost some 30 million cubic metres of timber (between 1945 and 1949) to bark beetles. The eight toothed spruce bark beetle has been found in traps set at British ports by the Forestry Commission. The beetles may make their way here in sub standard pallets that have not been properly debarked. The beetle cannot survive in finished timber,it needs bark. It bores its way through the bark (in the living tree) and sets up a breeding site - about 200 beetles are needed to form a breeding colony. 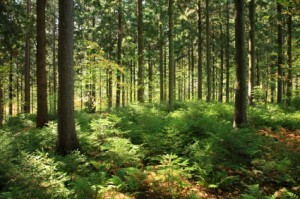 Spruce is a commercially important species, with perhaps some 800,000 hectares in the UK. Ground beetles – Carabids declining!